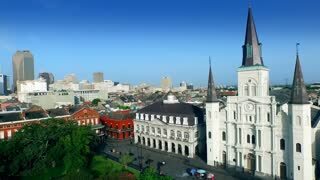 Drone descending into a park in Saint Louis, downtown houses in the background. 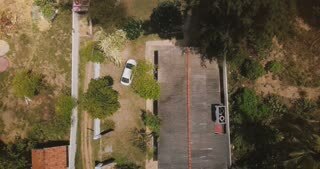 Top view drone descending and zooming in on idyllic tropical resort house with jungle palm trees, white car standing by. Drone descending right near Mont Saint Michel, iconic island fortress town, famous historic landmark castle in France. 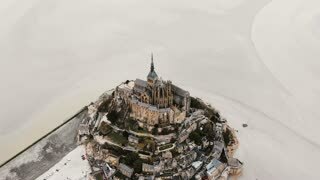 Drone slowly descending above Mont Saint Michel island fortress, famous French historic landmark town during low tide.